Each year the Dulles Area Association of REALTORS® recognizes REALTOR® professionals who have reached exceptional levels in various categories. Deadline to apply is Friday, February 15th, 2019. Professional Distinction: Prospective clients are often more likely to consider REALTORS® who are top in their fields. Third-party Validation: It’s always good when others sing your praises. A DAAR award will give you the accreditation you need to grow your business. Branding Opportunity: Award recipients will be featured in DAAR newsletters, on social media, and in area publications. Marketing Investment: For $49, recipients will have branding rights to award titles all year long and entry to the Awards Networking and Ceremony. Reward Yourself: You deserve it! Allow yourself a moment in the spotlight to honor your hard work. And let the momentum spark another successful year. Please print, sign and submit application forms to your broker for his/her signature. You may deliver or mail the application form and application fee to DAAR, 21720 Red Rum Dr. #177, Ashburn, VA 20147, fax to 703-771-9787 or scan and email to Beth Fischel, Membership Services Manager at bfischel@dullesarea.com. Save the Date! 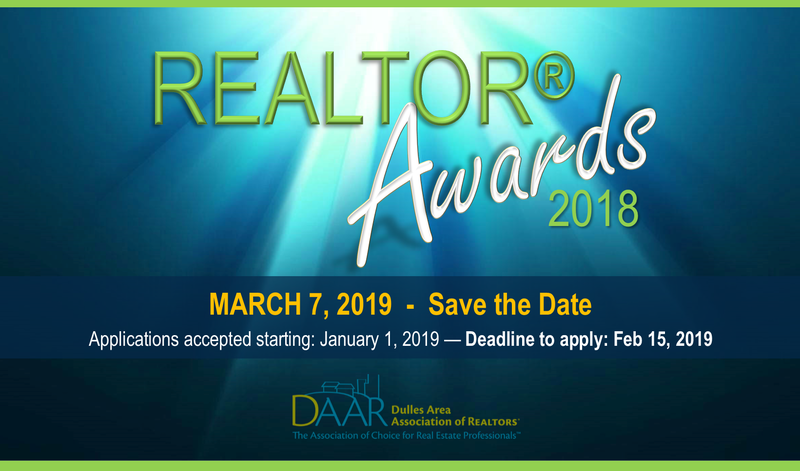 DAAR REALTOR® Awards Ceremony, March 7th! You’re cordially invited to join us as we recognize REALTOR® professionals who have reached exceptional levels in various categories above during DAAR’s Awards Ceremony on Wednesday, March 7th, 4:00 to 7:00 PM at 1757 Golf Club, 45120 Waxpool Road, Dulles, VA 20166. Early-bird registration of $35 for members until February 28th, 2019 includes two drink tickets and heavy hors d’oeuvres. After February 28th, the member fee is $45. Non-member registration is $55. For more information and to register click here.